Text or Call To Schedule An Appointment | 423-899-1112| Voted Best Cosmetic Dentist In Chattanooga 2018! Blog Are You Prepared For A Dental Emergency? ACCIDENTS ALWAYS SEEM to happen when we least expect them. When those accidents involve tooth damage, it’s important to know what steps to take. Being prepared before a dental emergency occurs can save a damaged or knocked out tooth, prevent infection and decrease the need for extensive treatment. The main thing to remember is our phone number 423-899-1112. If it is after hours there is Dr. McOmie’s cell phone number on the answering service so you can get in touch if needed. We have seen emergencies from Ringold, Dalton, Ooltewah, Chattanooga, Cleveland, Dayton, Dunlap, Hixson, Trenton and about everywhere else you can imagine. The key is time is essential. The most important step to being well-prepared for a dental emergency is establishing a dental home. Of course we want this dental home to be McOmie Family Dentistry. This means finding a dental practice that is right for you and sticking with it. When the worst happens unexpectedly, it can be a great help to have a dentist and practice you trust by your side. If you have found your dental home, you will likely be more familiar with their hours and know if and when your dentist provides emergency services. Dr. Mark McOmie and Dr. Ellen McOmie both handle emergencies daily. We want our patients to feel comfortable to call and to know we will be there for them. With an already established relationship, you know your preferred practice will be able to provide high-quality care, advice and support. We all know accidents happen. Being “prepared” simply means knowing what to do in certain situations before a mishap actually occurs. In a dental emergency, time is of the essence–it could mean the difference between saving or losing a tooth. If this happens to your child, contact Dr. McOmie as soon as possible. The tooth will most likely not be replanted because of potential damage to the developing permanent tooth. Contact our office immediately as prompt treatment is required. Rinse out your mouth with water and find any broken tooth fragments. Both Dr. Mark and Dr. Ellen are masters at fixing chipped teeth. Often times this can be done with bonding. Sometimes it may require a crown or a veneer, but the thing to remember is this can be fixed and done with no pain. Again, it is crucial to seek immediate medical attention from Dr McOmie . 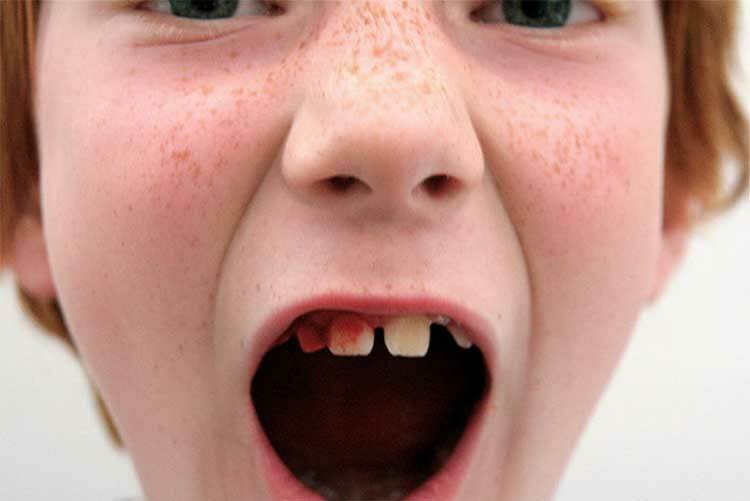 Most knocked-out teeth can be saved if a dentist is seen within 30 minutes to an hour of the accident. In the meantime, find the tooth and rinse it gently in cool water (no soap), without scrubbing or cleaning it. Replace the tooth back in the socket, if possible, and hold it there with clean gauze or a washcloth. If you cannot put the tooth back in the socket, place the tooth in a container with cold milk, saliva. This sounds crazy, but if your childs tooth is knocked out and you can’t find milk put it in your mouth to hold it until you can get to us. A toothache is an important dental emergency as well. When you call us in pain our first question will be “when can you come in?” We want to take care of you and make your life easier. If a toothache creeps up on the weekend give the office a call. There you will get Dr. McOmie’s personal cell phone number. Now how many other doctors give you there personal cell phone number just in case you need them? If you have a dental emergency, call us immediately. McOmie Family Dentistry 423-899-1112 We make it our priority to be here for you, rain or shine! Do you have any more questions? Let us know in the comments below or on our Facebook page! Thank you to our wonderful patients! Chattanooga Is #1 For Allergies, How Does This Effect Teeth? What Makes Chattanooga, TN So Special? I love my dentist! Everyone at the office is so nice and caring. The McOmies are great dentists (and people!) and their staff is always professional, nice, and helpful! They are an awesome dentistry! Me and my family have been seeing Dr. McOmie for years and they have taken very good care of our smiles! Love this place, always a fantastic job done by everyone! Very friendly and knowledgeable. I would definitely recommend them. Kristin was my hygienist and she was amazing. Everyone there is so friendly! Doctors Mark and Ellen McOmie plus their staff are always so nice and very professional. I always enjoy my vist. I recommend them to everyone. was very impressed with the staff and the doctor. It is all about you and what you want. He works on the best thing for you. Great job as always! Quality work fast and professional . I had a wonderful experience with both the Hygienist and the Dentist. I highly recommend this practice. Great dentistry! They listen to concerns and work with you about treatment and payment options. Highly recommended. Awesome experience, same day service in addition to the first consultation. Would highly recommend. Real Questions and Real Answers from Dr. Mark & Dr. Ellen McOmie. See the amazing results of our dental work for yourself in our patient Smile Gallery. Get in touch with us today to schedule your next appointment.